We were unusually lucky last week. We won a competition. Not the lottery, no. No, not the Deli of the Year contest either. We won tickets to go and spend the night with Rumi at the Logan Hall in Russell Square. Thanks to the very nice people at Six Pillars to Persia who broadcast on Resonance FM, we got to see the Roohafza Ensemble, who were utterly amazing. They take traditional Persian instrument the tanbur and raise it to another level. 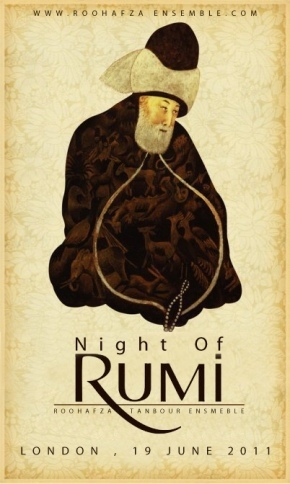 Their interpretation of the the works of the mystic Rumi is something else. We spent the whole evening on the edge of our chairs covered in goosebumps (but we are over-excitable like that)(and Rumi is known for having that effect on people anyway). Now we are aware of the fact that this was a their only UK concert, and that to post about it now is a bit mean as you may have to wait a while before they come here again…so we have ordered some of their CDs from Iran so that you can listen to them at home at least. In the meantime, here’s a clip to whet your appetite. Enjoy. Help – I’ve just bought bottomless jar of preserved lemons and don’t know what to do with them….